College (Architecture and Design, not graduated) at University of Buenos Aires, Argentina. The Rhythms of Indian percussion, with Indian Tabla maestro Mr. Zakir Hussain at Omega institute, Rhinebeck, New York, and San Anselmo, CA. Meredith Monk ensemble, Singing Body / Dancing Voice, at the House foundation, New York. Hands on Handruming with John Bergamo, Los Angeles, CA. Jazz singing workshop, with Mr Bob Raynold at the Manne’s institute of music, New York. Drum set workshops, with Mr. Kenny Aronoff, Tris Imbodem, Virgil Donati, New York. The Native American Rhythms, workshop with Mr. Ray Huenche, New York. Singing: Vocal technique in Classical music, with Prof. Ariel Mendelsohn. Vocal technique and coaching, with Prof. Graciela Leibovitz. Percussion: Escuela Superior de Percusión, Buenos Aires. Classical and Ethnic African and Oriental Roots, directed by Prof. Antonio Yepes. Drumset at Vinci Institute of Modern Music, with Prof. Ernesto Picardi, Bs. Aires. Spanish Flamenco, Cajon and Palmas. Latin percussion: Bongos, Congas, Timbales, etc. At Neopercusion music school, Madrid. Afro Brazilian instruments and styles of Samba, Bossa, Comparsa, Forro; Capoeira dance, with different teachers in Porto Alegre and Rio de Janeiro. • USA Currently as bandleader presenting a new band called SANKIRTAN: songs, bhajan, raga and kirtan vocal styles from India. CHILL OUT INDIA VIBE CD, featuring all original compositions based on sounds and instruments from India. LIBRES DEL MUNDO, as World percussionist and Singer, a Flamenco Latin World Beat band, Los Angeles, CA. The Artists of Eversound Records, live concert recording, 2012, Los Angeles, CA. DANCE IN THE DANCE CD by Stuart Hoffman, 2012 ,Los Angeles, CA. Urbethnic– Classical, Contemporary, Urban & Ethnic Percussion styles, Madrid, Spain. Agrupacion Platino’ – Latin Jazz, Paris, France. 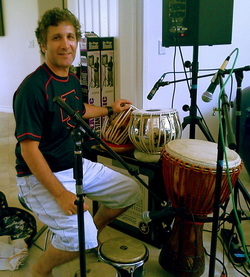 TABLA FOR ALL - TABLA PARA TODOS, A complete method for Indian Tabla Percussion set, written in English and Spanish (100 pages with 2 audio CDs). SANKIRTAN live at Bhakti Yoga Shala, Santa Monica, Los Angeles, CA. Libres Del Mundo Flamenco Latin World Beat, at Viceroy Hotel, King King, DCache, and other venues in Los Angeles area. Chill Out India Vibe, at The Green Temple, and different venues around Los Angeles. Dance in the Dance, CD presentations by Stuart Hoffman, 2012, Los Angeles, CA. Percuti Rhythm Ensemble at King King Hollywood; The Airliner, etc. 2012The Artists of Eversound Records, live concerts, 2012, Los Angeles, CA. The Band at The Floor, King King, Hollywood, CA. Featuring some of the best musicians and dancers in the Los Angeles Indie scene. with GROOVE TEMPLE LIVE at The Sanctuary in sta. monica, Los Angeles, CA. DJ Garth Trinidad (KCRW fm radio, Los Angeles) DJ music + World Percussion set and guests. At Nokia Theatre, House of Blues, Standard Hotel, etc. Magnolia Memoir, at King King, Molly Malones, Hotel Café, Bootleg Theater. The Floor at King King Hollywood, improv night for Musicians and Dancers. Walter Davis Band, at East Side Luv Bar, Downtown Los Angeles. Acharonim Klezmer, at Long Beach Contemporary Museum, and private events. Sonic Chakras Workshop, with Andrea Brook, at Omega Institute, Rhinebeck, NY. J’wish dub, ethnic fusion music, at the Orensanz foundation, NYC. Captain Hilarious, Folk-Rock fusion band, at SIR studios, NYC. Carolina Cerisola, at King King and East Side Luv, presenting Burlesque and Salsa Dance, Los Angeles, CA. Reciprocate, a Dance & music program along with Peter Sciscioli at the Joyce theatre NYC. Zendora Dance company, presenting ‘ The Time of Footsteps – Impressions of Giacometti, at La Plaza cultural community gardens, NYC. World Percussion set: Indian Percussion Tabla set, Ghatam, Mridangam, Kanjira, Moorsing – Mid eastern Darbuka, Bendir, Riq, Zils – African Djembe – Latin Congas, Bongos, Timbales, Claves, Guiro and accessories – Spanish Cajon Flamenco, Drum kit, Panderos (Handrumming) Frame Drums 22’’/ 18’’/ 14’’, Andean Bombo Leguero, small percussion and accessories. Ibanez JX70 acoustic guitar. Other related skills and knowledge: Administration and Management, Computer skills in both Mac and PC platforms.